Logitech Harmony Remote Battery - Real or Fake? Logitech no longer manufactures or sells the battery that is used in the Harmony 880/890, Harmony One/900. The original ‘blue-labeled’ battery rated at 950mAh was problematic and tended to swell and become trapped in the battery compartment. These are still sold on the aftermarket on Amazon or Ebay and they should be avoided. In addition, there are counterfeit ‘blue-labeled’ batteries on the market that try to pass themselves off as Logitech-branded. These can actually damage your remote, so the best bet is to simply avoid any battery that has a blue label on it. 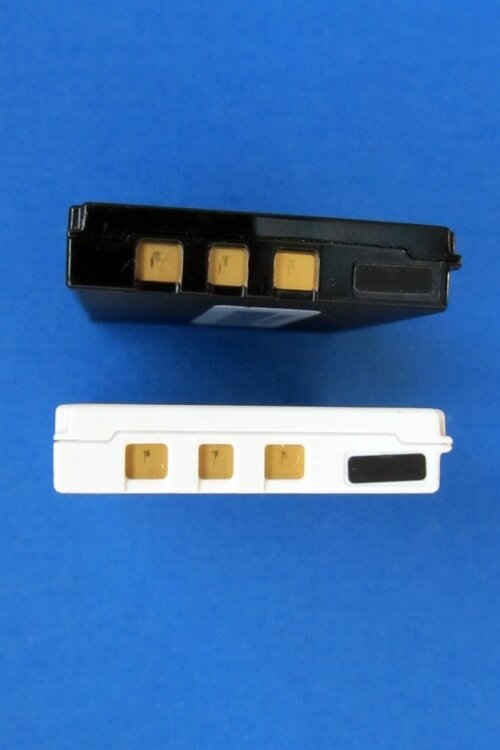 So, that leaves you with two good choices; Logitech manufactured a white (sometimes black) battery rated at 930mAh. These batteries do not have a stick-on paper label and instead, the Logitech logo is actually silkscreened/embossed on the battery itself (see picture). This is the preferred battery to use, if you can find it, which is often difficult. Avoid any 'white' battery this is branded as a Logitech battery that has a paper, stick-on label on it, as this is definitely a counterfeit. The second good option is to purchase a high-quality compatible battery. We have had good experience with the UpStart-branded battery and many of our customers have also used the Lenmar and Rayovac brands. Do not worry about the amp-hour rating (mAh) – you are fine with 930 or 950. This is only referring to the charging capacity of the battery and the larger the amp-hour rating, the longer the battery can go before recharging. Since the remote is typically placed into the cradle when not in use (which is fine), the difference is not significant. 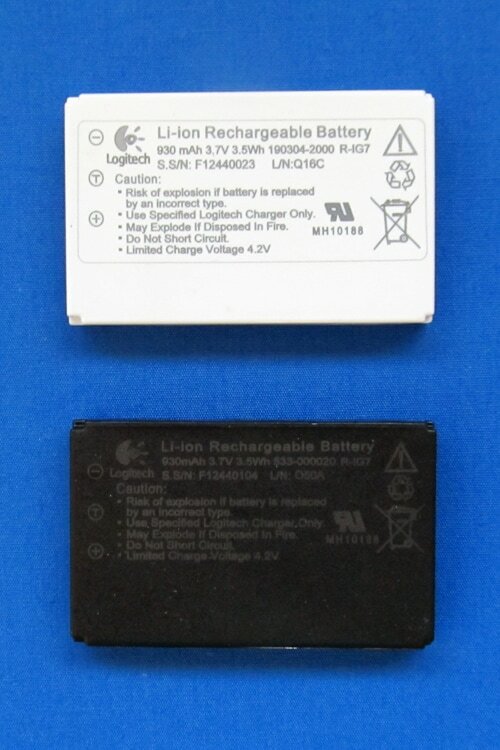 These pictures show legitimate Logitech-branded batteries that do not have the swelling problem.